An attempt at chronicling my adventures in the kitchen, with culinary school, and the things related to food that light my imagination and stir my fancy! Both my guys decided to get sick this weekend. I made them some soup to help them get back on their feet quicker. There is a reason chicken soup is called the Jewish grandmother's penicillin. Those little golden droplets floating on the top of homemade stock are full of immune boosters and vitamins. Next time someone you love is feeling under the weather, make some soup and see how quickly the sun comes back out again. First make the chicken stock. If you already have chicken stock made- you can use that, and then add some already cooked chicken to the soup. Cover the chicken with cold water in a stock pot. Add vinegar and bring to a boil. Once it comes to a boil "scum" will form on the surface. Skim the scum off. Although not harmful, these proteins will cloud the stock, and give it an off flavor. After skimming the surface, lower the temp to a simmer. Once the chicken is gently cooked , take the meat off the bones, and then put the bones back in the pan. Simmer gently for a total of 6-8 hours. About half way through, add the vegetables and seasonings. In a saute pan melt 1 Tbs butter. Add onions and caramelize. Add carrots to the pan and cook until tender and caramelized. Cook the garlic until fragrant, adding more butter if necessary. Add celery and cook until tender. 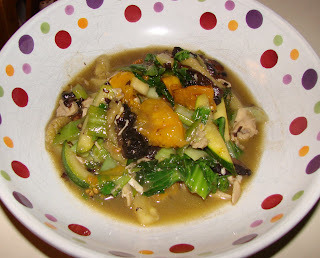 Place cooked veggies in chicken broth and bring to a simmer. Add green beans, and cook for 3-5 min, until almost tender. Add chicken, basil, rosemary, oregano, crushed tomatoes, and squash, Cook another 5-7 minutes, or until all vegetables are tender. This soup can be served two ways. This was my hubby's favorite way. Soup with either creme fraiche, or sour cream stirred in. Feeling like you need some more protein? Gently scramble a couple of eggs and add it to the soup for an extra punch! I LOVE the broth part of a soup. So when I make it, I typically double the stock quantity and double the herbs. I try really hard to take a picture of my recipes nicely plated. For the record- that did not happen this time. I was so enthralled with the flavor profile- that I totally spaced. Luckily there was a small amount left over- so I took some quick pictures of that. In a dutch oven, heat the oil until hot- just below the smoking point. Season the roast with salt and pepper, and sear in the hot fat until nicely browned. Set the roast aside. Add onion and caramelize. Adding more fat if necessary, add the carrots and caramelize them also. Toss the garlic in, coating well with the cooking fat. Being careful not to burn that garlic, cook until very fragrant. Now add the celery. It's important not to add the celery until after your done caramelizing the other vegetables. Celery has such a high water content that it will stop the carmalization, and cause the veggies to steam instead. Once the celery is tender, deglaze the pan with the red wine, scraping up all the brown bits (fond) on the bottom of the pan. Add the roast back to the pan. Pour the beef broth (or broth water combination) in the pan, covering the roast 2/3 of the way. Add the thyme bundle and cover tightly with lid. Place in a preheated 350 degree oven. Cook for 2.5-3.5 hours, or until meat is very tender and falling apart. If your pan doesn't have a tight lid- you will need to monitor the broth level, adding more water if it gets too low. It doesn't need to continue covering the roast by 2/3 - but don't let it run dry. As you get close to the end of the cooking time, the broth will get thicker- this is good, it's creating a great sauce. Once roast is cooked, remove from the pan, cover, and set aside to rest. Remove and discard the thyme and bay leaf. Pour the some of the liquid and all the vegetables into a blender and puree. Once pureed, pass through a fine strainer or chinos back into the pan. Heat up the sauce and stir to combine the puree with the liquid. Reduce until the sauce is nape (a sauce which is nape will coat the back of a spoon, and a line drawn through the sauce will remain clear even as the spoon is turned around.) Once nape, monter au beurre with the cold butter. I served this with rosemary roasted potato/butternut squash, a balsamic arugula salad, and sauteed lemony butter broccoli. When I roast a chicken I like to save all the pan drippings. Store them in the fridge in a jar and the fats will rise to the top, while the broth congeals on the bottom. These are wonderfully flavorful, and full of healthy gelatin, minerals, and fats. Tonight I used leftover pan drippings as the basis for flavorful broth and stir-fry. Scoop the chicken fat off the top of the drippings and add to a hot skillet or wok. Add zucchini, seasoning with salt and pepper. Lightly saute - but don't cook all the way. Now add the bok choy and saute until wilted. Next add the mushrooms and sweat lightly. Once everything is close to being cooked, add the tomatoes, diced chicken, and the remaining pan drippings. Melt the gelatinous broth(pan drippings), and soften the tomatoes. Everything should be tender and hot. Dice the butter and add it. This is called to monte au buerre, which means to whisk cold butter into a sauce to add richness and gloss. Adjust the salt and pepper as needed. You are going to be amazed at the wonderful flavor in this stir-fry! Let me know what you think. This was a little girl's first birthday cake. It was a lot of fun to make. I'm not a fan of fondant covered cakes. Although beautiful, I believe cakes should be equally delicious in the mouth and to the eyes. Covering a cake in fondant requires that you put a thinner layer of icing underneath than normal. Since I use Italian buttercream, the icing is one of the most decedent, desirable parts of the cake. This cake I iced in Italian buttercream, but did a finishing technique to make it look like fondant. All the accents (stripes, balls, butterflies, flowers, dots, and letters) were fondant. Melt butter in a stainless steel pan. Heat to medium high heat. Salt and pepper the salmon. 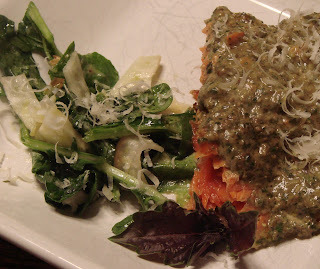 Once the pan is sizzling hot- add the salmon skin side down. Once nicely browned flip over. While salmon is cooking, warm the cream on the stove. Remove cream from heat and add pesto (to taste). Pull salmon off while still translucent in the center. If your pan is hot enough- you will sear the salmon quickly without over cooking it. Should only take 4-5 minutes on the first side, the 1-2 minutes after flipping to finish the cooking. Tear arugula into bite size pieces. Taste the arugula. If it's really strong/peppery- then use less lemon. Dress with oil and lemon juice. Season with salt and pepper. Thinly slice and and cut into medium size pieces the fennel bulb. Layer on top of arugula. Add freshly grated Parmesan and drizzle with oil. I love this recipe. It's always been a hit, the flavors are subtly Mediterranean, but well rounded. I'm sure you'll love it also. Please- make sure and allow time for the orzo to truly absorb the dressing before adding the other ingredients. It creates a much nicer finished salad. If you are not familiar with Balsamic vinegar, this is a great introduction. It has an amazing depth of flavor, and a wide variety of uses in the kitchen. Everything from marinade for grilled chicken, a bold salad dressing, to reducing it down to a glaze, or even using (reduced) over ice cream! If you are near a sprouts-you'll probably want to get your pine nuts there. You can find them in the "bulk section". This is nice because 1.- you can buy the amount you need, and not extra- if this is a new, or not often used ingredient for you. Toasting nuts is done to improve the flavor. When you toast a nut or seed, the oils are released and brought to the surface. Most of the flavor is in the oil- so it intensifies the experience- without adding extra product. The best way to toast a nut is in a small dry (no oil) saute pan. Please watch your pan VERY closely. This is one of those items you never walk away from. At first it will look like nothing is happening, and then as you jiggle, or stir the pan, all the sudden the nuts will start looking toasted.....the path from lovely and toasted- to burnt- is only about 90 seconds! Bring a LARGE pot of water to a boil. You want your pasta to be able to move very freely in the water as it cooks. Salt very generously. Pasta can only absorb salt though the cooking water. So you want your water to taste like the ocean. Cook orzo uncovered, stirring occasionally for about 10 minutes. 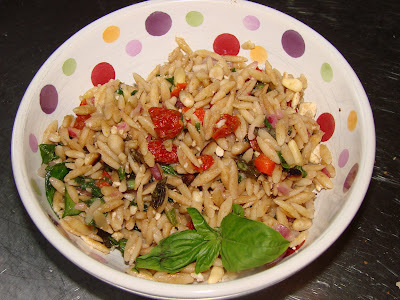 While pasta is boiling, toast pine nuts to a golden brown. Prep all the vegetables. Set aside. In a large bowl- combine oil and vinegar. Drain orzo pasta well. Add to oil and vinegar and toss to coat. Let this mixture sit for 10 minutes. Toss in remaining ingredients. Can be served room temp or chilled. Taste best (in my opinion) if allowed to sit, in the fridge for about an hour, then served- room temp or slightly chilled. For my readers.....please forgive me in advance if I don't post as often as I should, or as perfectly as I should! I've been wanting to start this blog for about 3 months now. Everytime though, I either took a picture of the food, and forgot the recipe, or loved the recipe and forgot to photgraph it before it was consumed! I've decided to just start- and tweak and improve along the way. Comments welcome (and loved) !!!! But turn on the stove and let's go! All recipes listed here are guidelines. The ingredient amounts are not exact, but rather rough figures to use as a starting point. All families have different taste preferences, and seasonings should be adjusted accordingly. Taste, Taste, and then Taste some more!